This phrase is used teasingly and says that the person whose own fault it is should have known better, or simply had it coming. The noun ‘bult’ probably means ‘hunch’ (as in hunchback). The ‘Van Dale Groot Uitdrukkingen woordenboek’ hints that this may date back to superstition saying that hunchbacks were to blame themselves for having a hunchback. In the meaning of ‘hunch’, we also use the word ‘bochel’ and ‘hunchback’ then becomes ‘gebochelde’ (e.g. ‘De gebochelde van de Notre Dame’). – “Het is je eigen stomme schuld”: similar to ‘eigen schuld, dikke bult’. Lit. : ‘it is your own stupid fault’. – “Boontje komt om zijn loontje”: serves you right! – “Lekker puh!“: na na na na na! – Schuld: fault, debt, guilt [noun] [de schuld, de schulden]. – Bult: lump, hunch, hump [noun] [de bult, de bulten]. – Bochel: hunch, hump [noun] [de bochel, de bochels]. – Gebochelde: hunchback [noun] [de gebochelde, de gebochelden]. 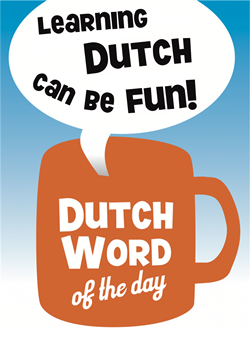 This entry was posted in Dutch phrase of the week, DWOTD 1.0, Vocabulary Intermediate and tagged bochel, bult, eigen schuld dikke bult, gebochelde, schuld by Sander. Bookmark the permalink. “Serves you right” might also be a good translation here if i’m understanding it right :). Sander, I’m wondering in these days of political correctness and inter-ethnic sensitivities have there been any moves over there to rename “moorkoppen” to something less, err, controversial? A similar case that has actually led to renaming, is one of my favourite childhood treats: the ‘negerzoen’ (chocolate-coated-marshmallow-like treat). Although this name is definitely debatable, as a child I never had any such connotation. They are now called ‘Buys zoenen’ with ‘Buys’ the producing brand (http://www.buyszoenen.nl). I understand (and appreciate) that outside the Netherlands people may frown on the concept of ‘Zwarte Piet’ but as a child I only remember the excitement of the presents, and de ‘Zwarte Pieten’ throwing candy into the classroom and through the letterbox. Actually only in recent years this has become a real debate. Oh yes, I fully agree with your last paragraph. Even more so since in Belgium once I had to explain to two female friends why it was probably not acceptable to say they were renting their house to a family of “negers” – something that would land you in court in the UK probably. But, they really didn’t see anything wrong with it, their intent being descriptive rather than racist. I think they are now called something else, thank goodness. Still, that was at the time when there was a “comedy” (I use the term loosely) programme on the TV which had the scenario of people living next to a black family as its premise: “My N****r Next Door” or something (I exaggerate the title for effect). And also the egregious “Black and White Minstrel Show” which featured popular old-time songs performed by “blacked-up” performers (a la Zwarte Piet).